Information The game was indexed in Germany until 2012. 7.88 points at 26 votes (rank 107). Gamebase64 9 5/5 "Very Good"
The evil Bungeling Empire wants to conquer the world again (and this, although they already took a pasting one year earlier in the game Lode Runner); this time with a War Machine that is programmed to conquer the whole world. Luckily, this machine is still under construction, which is in the six factories in the Bungeling Bay. To avoid it being finished, theses six factories now need to be destroyed. For this, the Forces of Good (FOG) have the carrier "Adequate" with five "Wildfire Z39" helicopters available. Well, better than nothing! This about the destiny of democracy in the whole free world after all! Black bombers; their task is to destroy the air craft carrier. Furthermore, the Bungeling Empire also builds a Battleship. If they manage to finish this big and dangerous ship, it will sail to destroy the air craft carrier. It is also equipped with heat-guided missiles. Graphics and sound during the game are simple, but appropriate. There is no music. All game relevant objects can be clearly recognized. 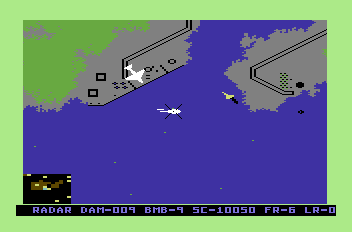 Raid on Bungeling Bay is one of the few games where the colour of the screen border has a meaning; by this, you instantly see how much damage the helicopter has taken. And if I would not write it here, nobody would notice, that the white crests on the water are grassgreen. When all factories are destroyed you have won the game. There are bonus points for lifes that might still be left and then you can watch the end sequence which consists of a newspaper article (whose content depends on how many lives you have lost or respectively whether the carrier was scuppered) and a (graphically very simple-kept) triumph parade. The latter is of course omitted when no pilot has survived (this can only happen by crashing onto the last factory with the helicopter and with this fully destroying the factory). A closer look into the newspaper shows that Raid on Bungeling Bay plays on 1st April 1999 (which was a Thursday). Not on the previous day, which the special edition mentions in the case of "all 5 lives lost", that the victory was on the same day. The game area has a size of 10 x 10 screens; this would correspond to a memory requirement of approx. 100kB - more than is available in the C64. Therefore, the game area is build up of segments ("tiles"), whereby a single segment is used again and again for the big water areas. By this, the memory requirement is reduced to approx. 34kB. Altogether only 4 colours are used for the game area; by this the colorRAM does not need to be scrolled. Cannonry, radar devices and also the factories are shown by sprites. When controlling with the joystick, a bomb is thrown by pressing the fire button for a longer time. You can also use keyboard and joystick in combination; this allows throwing a bomb without a time lag (key Z) or respectively, firing at the same time (space). 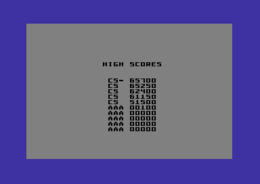 The highscore list (it is saved in the disk version) can be shown by pressing F1; the running game is then aborted. The colour of the factories give a hint to how many bombs you need for the desctruction. For some factories, the 9 bombs that you have with you are not enough, so that you need to fly several attacks. As the destroyed factories are automatically repaired again, you should hurry with the destruction. Destroyed cannonry and radar devices are also rebuilt again. If you destroy supplier boats and tanks, the efficiency of the factories is lowered. The Battleship is assembled in a dock (on the map it is the island at the upper right). You can bomb it to delay its completion. Even when the ship is done, you can still bomb it; the destruction is then a bit more difficult (but in return it is final). As the carrier moves permanently, you constantly need to reorient yourself; if you have a good sense of direction (or a map), this is an advantage. If you get the message that the carrier is attacked, you should instantly help there. Once it is scuppered, there is no possibility to get the helicopter repaired. The direction in which the carrier is, is shown by the arrow in the status bar. New bombs cannot only be fetched on the carrier, but also on the biggest island (at the upper left of the map). Here you can land on a "parking space" at the end of the runway. However, damages are not being repaired there! Klaws: "A real top game - though not concerning graphics and sound, but in any case concerning the fun. The difficulty grade is well balanced so that the motivation and the challenge remain even after playing many times. If you do not know Raid on Bungeling Bay yet, you have missed something." Robotron2084: "Raid on Bungeling Bay starts at first very innocently and slowly and then unleashs one after the other a true boiling pot of breathtaking action. Suddenly you have got your hands full with shaking off controlled rockets and jets, while the own carrier is struck with bombers. I do only know few games that throw so much explosive action at you (in the truest sense of the word). And if you finally made it to the end you can still try to get through with less losses to optimize the score. Raid on Bungeling Bay is an absolute highlight. 9 out of 10 points." TheRyk: "Make war, not love! The difficulty level seems far too easy - at the beginning! But after destroying the first factory, the enemy army, navy and especially airforce strike back and give you a hard time. Music might have made this even better, but considering this is from 1983, I must rate this 10/10." Fulgore: "Sunday morning, no school, the dog has already been out - what are you going to do all day? Exactly, you are looking forwards to hour-long action in Raid on Bungeling Bay. The game was at that time the top crack. With each destroyed factory, the game got more difficult and there was more action. Boredom never arose in this game. I like to play it also today every now and then and therefore I give 9 out of 10 points." 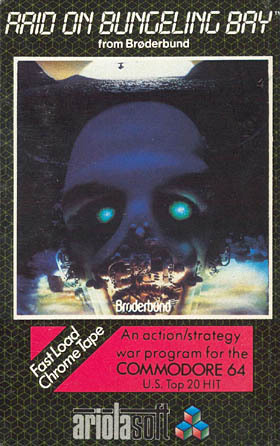 Raid on Bungeling Bay was ported to different systems but also to game consoles as the NES. 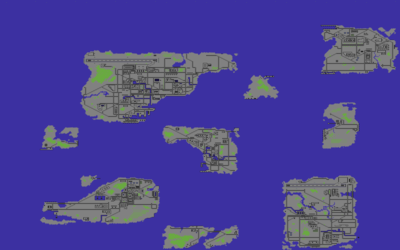 The game was written by the legend developer Will Wright, the creator of "Sim City" and "The Sims".